OAKLAND, Calif. (AP) One night last week, Kevin Durant sat out. On Monday, it was Stephen Curry with the same bruised thigh muscle that sidelined the NBA Finals MVP. Both games, Golden State showed off its remarkable depth, withstanding the absence of a big star. Durant had 21 points, a season-high eight assists and seven rebounds, Shaun Livingston scored a season-best 16 points in place of the injure Curry, and the champion Warriors pulled away in the second half to beat the Orlando Magic 110-100 for their seventh straight win. Klay Thompson credited the front office for keeping the talented, loaded roster intact. Nikola Vucevic scored 20 points, Evan Fournier had 16 and Aaron Gordon added 10 points and 10 rebounds in the Magic’s fourth defeat over six games. Livingston also had six assists on a night they were without Curry as he nursed a bruised right thigh from where he took a knee Saturday night. Durant sat out with the same injury to his left leg last Wednesday against Minnesota. Coach Steve Kerr called them similar injuries and is being cautious with two-time MVP Curry, who sat out on his bobblehead giveaway night and has only been receiving treatment on the leg without any on-court work. Thompson contributed 15 points, five assists and four rebounds in Golden State’s ninth straight victory against the Magic and fifth in a row at Oracle Arena. David West added 11 rebounds and five of the Warriors’ 35 assists. ”This is good for us, honestly,” Livingston said. ”All I know is that we’re really, really lucky to have the talent that we do,” Kerr said. ”We can win games without Steph or KD or Draymond or Klay because we’ve got a lot of guys and a lot of guys who can really play. It’s an incredible roster and we should be able to win games when some of our stars are down. Golden State held the Magic to 19 points in the third while scoring 32 to take control, leading 88-75 going into the final 12 minutes. Magic: F Jonathan Isaac was sidelined by a sprained right ankle that he injured in the fourth quarter Saturday night in Denver, where he left the arena in a walking boot. … Elfrid Payton returned to the lineup after sitting out Saturday as a precaution given his previous left hamstring trouble, while G D.J. Augustin missed his fifth straight game Monday with a strained left hamstring. ”We can’t worry about who’s not in uniform,” Vogel said. … Former Warrior Marreese Speights drew cheers when he checked into the game at the start of the second. Warriors: Livingston made his ninth start for Golden State and first since April 8 this year vs. New Orleans. … Rookie Jordan Bell was inactive. C Damian Jones was recalled from the G League but inactive after Kerr wanted him to take part in morning shootaround and be around the team. Two-way player Quinn Cook got in the game late. 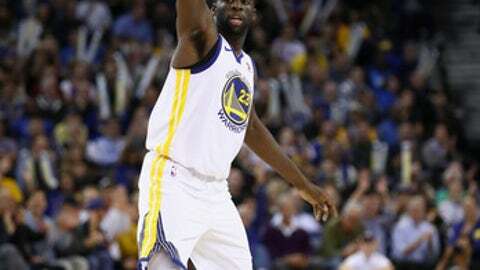 Curry and Durant caught a game in Santa Cruz last Friday. Magic: At Portland on Wednesday to wrap up a four-game road swing out West. Warriors: Golden State will practice in Oakland on Tuesday before leaving the next day ahead of Thursday’s game at Boston – where the Warriors have won four straight.